Choreographers Laura Aris and Jos Baker join forces to bring an evening of two solos that form one captivating performance. Let Sleeping Dogs Lie by Laura Aris and Of No Fixed Abode by Jos Baker center around themes of isolation, loneliness, sacrifice and wanderlust. Each solo brings a personal journey, a perspective. 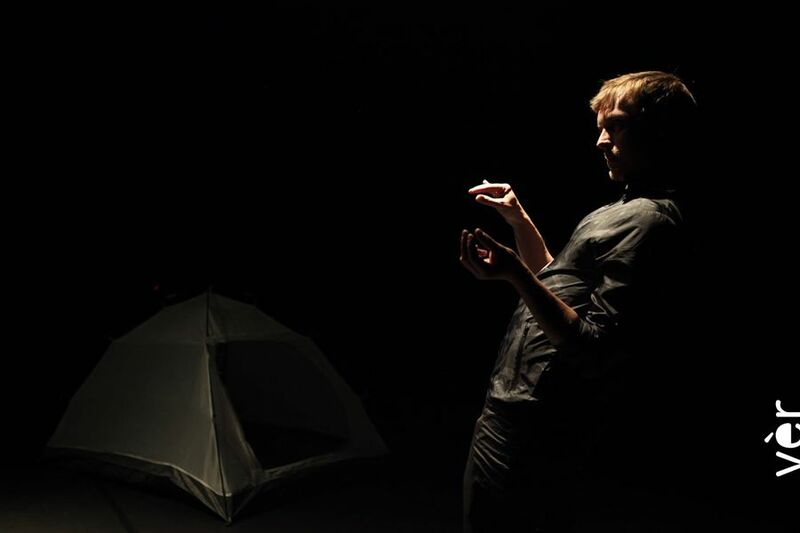 A double bill performance, this evening of work reflects on issues raised by the transient lifestyle of a performer and brings two unique voices and movement languages to shared experiences. The proposals for these works were in gestation for several years, and over time, Jos and Laura have been external eyes on each other's work. Of No Fixed Abode and Let Sleeping Dogs Lie is a co production of Sismògraf Dance Festival (Catalonia) and Roxy Theater in Basel (Switzerland); with the support of The Swedish Arts Grants Committee and residences at La Caldera (Barcelona), Destelheiden Art Center (Belgium), Studio Belgica and Ultima Vez studio (Brussels). Jos worked for Peeping Tom, DV8 Physical Theatre. He has created several of his own works and performed in several audiovisual projects. He also teaches internationally, offering a range of classes and workshops for professional dancers at institutions including SEAD, TrinityLaban, The Place, Amsterdam Theatre school, Deltebre Dansa, PARTS Summer School, El Danseu Festival, and many others. Los coreógrafos Laura Aris y Jos Baker unen fuerzas para componer una noche compuesta por dos solos . Let Sleeping Dogs Lie de Laura Aris y Of No Fixed Abode de Jos Baker circulan alrededor de temas como el aislamiento y la soledad. Cada comparte un viaje personal, una perspectiva. Un programa doble; Una reflexión sobre temas similares, a raiz de compartir el estilo de vida transitorio del artista viajero. Cada uno aporta su voz única y lenguaje de movimiento particular. Ambas propuestas han estado en gestación durante varios años, y en los ultimos mese de creación se han convertido en el ojo externo del trabajo del otro. Of No Fixed Abode y Let Sleeping Dogs Lie son coproducción del Festival de Danza Sismògraf (Cataluña) y se pre-estrenaran en Teatro Roxy en Basel-Suiza. Con apoyo del Comité de Subvenciones de Artes Sueco, Centro de Creación La Caldera (Barcelona), Centro de Arte Destelheiden (Bélgica), Studio Belgica y Ultima Viez en Bruselas. Jos ha trabajado para Peeping Tom y DV8 Physical Theatre. Tiene varias obras de creación propia y ha participado en varios porjectos audiovisiales. También imparte cursos a nivel internacional, ofreciendo una variedad de clases y talleres para bailarines profesionales en instituciones incluyendo SEAD, Trinity Laban, The Place, Deltebre Dansa, PARTS Summer School, El Danseu Festival, entre otros. "At Any Given Morning" is the result of the collaboration between two independent artists who come together under the frame work of The Anatomy of Broken Things, defined by Laura Aris within a personal curiosity that has led her to develop other projects under the same concept with several artist. when a simple whisper can tip the scales. After years of working under the baton of different choreographers, companies and several choreographers, Álvaro begins to discover his personal movement supported by self-awareness techniques and meditation, giving emphasis to the development of awareness, all physical, emotional and energetic sense. Today, beside of been still part of the companies Cia. Daniel Abreu (ES) and CocoonDance (DE), he is looking forwards to new projects, following a work line that influences different configurations of the body, in it is absent - present , leading him into collaborations with other artists. 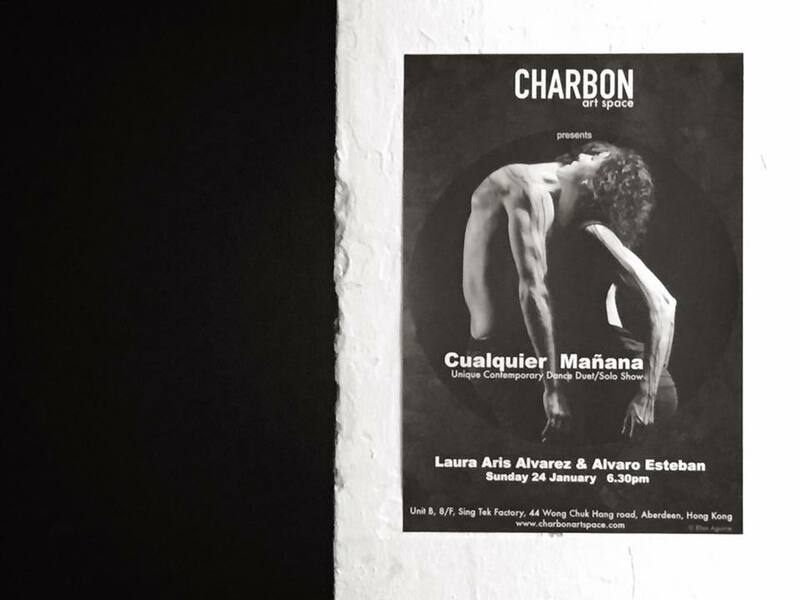 Álvaro co-created "Cuadra-T ” together with Natxo Montero, Finalist at the Choreographic Competition of Madrid 2008. Also co-created "Entomo" together with Elias Aguirre, a multi - awarded piece still on tour and with more than 100 performances worldwide. Cualquier Mañana film is an audiovisual production of DAR-Dance Academy Russia in collaboration with Kim.Video company, after the dance duet created by Álvaro Esteban and Laura Aris with original music score of Roger Marín. With the support of Embassy of Spain in Russian Federation | Embajada de España en Moscú - Federación de Rusia. Special thanks to HKAPA- Hong Kong Academy for Performing Arts, Sarah Oliver, Eugeniya, Arseniy and little Leon Kim. Vitaly Kim is a director, choreographer and film-maker from St.Petersburg. He is the head of STAGE DFT Company (DANCE FILM THEATRE), the main goal of which is the creation of dance films and performances, and moreover the promotion of dance film as a unique genre of art in Russia. Dance Academy Russia (DAR) is an educational center, based in St.Petersburg, Russia. DAR provides for high quality dance education and creation opportunities in St. Petersburg, worldwide and through its online courses. DAR organizes international project DASS, building connection to communities, institutes, companies and festivals in the area of Dance and Theater arts abroad and Festival DAR in Russia with pedagogical, performing and stage experience exchange between Russian dancers and foreign teachers and choreographers. Since 1998, Y-Space maintains a platform named “Improvisation Land”. It exists for artists of different media to meet and have an improvisational jam from time to time. In gathering artists from around the world and across the areas of dance, installation art, music, lighting design and visual arts, artists interact spontaneously - beyond the usual practice of choreographed performances. Being unpredictable could be risky, but it could also be a surprise. Dance artist Mandy Yim and Victor Choi-wo established Y-Space in 1995 in Hong Kong. The aim is to explore the infinite possibilities of performance through dance and to search for new dance languages and ways of performing. After 19 years, Y-Space is still dedicated to developing it's roots in local culture as it works with and supports international visions. Y-Space has cultivated spaces for creativity in local communities and schools, and they have a loyal public following. International invitations and tours have taken Y-Space to 18 cities in 12 countries. Desde 1998, Y-Space creó una plataforma llamada "Improvisation Land" para unir a artistas de diferentes disciplinas y organizan sessiones de jamm juntos. Reunen a artistas de todo el mundo, de áreas de danza, música, diseño de iluminación, instalación o artes visuales, y los invitan a interactuaría espontáneamente, más allá de la práctica habitual de una representación coreográfica. Ser impredecibles puede ser arriesgado, pero también puede convertise en sorpresa. Los bailarines-creadores Mandy Yim y Victor Choi-wo establecen Y-Space en 1995 en Hong Kong. El objetivo es explorar las infinitas posibilidades de comunicación a través de la danza, y la búsqueda de nuevas lenguas y formas de actuación. Después de 19 años, Y-Space se ha dedicado a desarrollar discursos arraigados en su cultura, como también con influencias internacionales. Y-Space ha cultivado espacios de creatividad en escuelas y la comunidad local, así ha conseguido crear un público fiel a sus actividades y eventos. Y-Space ha recibido Invitaciones que le han llevado a visitar 18 ciudades en 12 países. In 2014, Laura was guest artist at Guerilla Project during the Art Basel - Hong Kong international exhibition at Chai Wan Mei, and she was guest artist at Karin Weber gallery in central Hong Kong. MicroAcciones is a dance intervention project taking place in museums, art galleries or other, specific locations out of context from the theater. Initially created together with Jorge Jáuregui, MicroAcciones have been going on since 2011. For Chai Wan Mei’s Art Guerilla Project, Laura Aris presented several new MicroAcciones. Some of them were part of the existing oeuvre, others were created specifically for the Industrial City - located in specific corners, elevators, or corridors of the building - still more were totally improvised, traveling through different locations. Through physical interaction, performers addressed the specific architecture and design of the building, the art works exhibited, and the people visiting the place. Stéphanie is a French - Mexican dancer and producer with great interest in visual arts. She currently studies Visual Arts at Centre Saint Charles Université Paris 1 - Sorbonne, France and is engaged in many different artistic and pedagogical projects in Mexico. A liv­ing, breath­ing entity with major com­po­nents made of water, car­bon, min­er­als and other com­pounds. Atom­i­cally sta­ble, able to con­tem­plate the vast­ness of the uni­verse while smil­ing in the float­ing air, that is me, and also…Album producer / musician / ex-guitarist / song writer and vocal of Huh!? I have been photographing dance for a few years. Usually, these shots take place in a studio, on a stage, or even in a cultural space. Recently, I wanted to take a different look at the dance, far from the studios and the stage, far from the costumes, lights, and specific choreographic sets. He fotografiando danza durante algunos años. Por lo general, las sesiones tienen lugar en un estudio, un escenario, o incluso en un espacio cultural. Recientemente, quería ver la danza de otra manera. Lejos de los estudios y el escenario. Lejos de los trajes, luces y coreografias. A Collaborative project between EMBER and LA MACANA created in 2010. Cola de Gallo is a literal Spanish translation of cocktail. Ours is an artistic cocktail. A short, collective, creative process - almost spontaneous - in which in a state of immediacy gathers up our primal essences, fresh and sudden. A mutual desire to explore the universe we could create together, the result has included encounters between Galicia, Barcelona, and Bilbao. the prairie has only tilted to become a wall. we have to lift our feet and step on it. "... Artistic cocktail of four performers who stand out for their strength and energy with an exceptional technical quality"
Together, they also created a composed evening of short pieces named DOUBLE TRACK (56’). La Macana is a Spanish dance company founded by Caterina Varela and Alexis Fernández in 2009, Galicia (Spain). Cola de Gallo es la traducción literal de la palabra cóctel. El nuestro es un cóctel artístico. Un proceso corto, casi espontáneo, donde recogimos desde la inmediatez las esencias primeras, frescas y repentinas. Resultado de encuentros entre Galicia, Barcelona y Bilbao. Un deseo mutuo por explorar el universo que se crea con esta fusión. Esto es una fábrica de metros tras metros. La Macana es una compañía de danza española fundada por Caterina Varela y Alexis Fernández en 2009 y sede en Galicia. Y del Resto No sé Nada was a commissioned work for the festival Dies de Dansa in Barcelona in 2008. The choreographic material was originally created by Laura Aris and Germán Jáuregui for the Belgian dance company Ultima Vez, where both were members. Some of their choreographic material was used in the performances Sonic Boom and Puur as directed by Wim Vandekeybus. Thanks to Wim and the Company for their permission and support. Germán Jauregui is a Spanish director, choreographer, dancer and pedagogue based in Brussels. In 1998, he joined the company Ultima Vez/Wim Vandekeybus and worked as a dancer, movement assistance and rehearsal director. Since 2007, he has developed his own work, creating the pieces “Sunset on Mars” (2009), “Confession” (2013) and“Isaac y Diola” (2016) together with the choreographer Antia Diaz. Una mujer pierde el sentido y reta a un hombre a recogerla a tiempo, antes de que se estrelle contra el suelo. Esta acción se repite una y otra vez. Podrán a prueba la confianza entre los dos, su voluntad, su resistencia, su perseverancia. Se ayudan, dependen del otro, comparten una misma carga. En definitiva, una historia de amor. Y del Resto No sé Nada fue un trabajo de comisión para el festival Dies de Dansa en Barcelona en 2008. El material coreográfico fue creado originalmente por Laura Aris y Germán Jáuregui para la compañía belga Ultima Vez, donde ambos eran miembros. Parte del material coreográfico fue extraído de los espectáculos Sonic Boom y Puur, dirigidas por Wim Vandekeybus. Gracias a Wim y la Compañía por su permiso y apoyo. Germán Jauregui es director, coreógrafo, bailarín y pedagogo residente en Bruselas. En 1998 se incorpora a la Compañía Ultima Vez / Wim Vandekeybus y trabaja como bailarín, asistente de movimiento y repetidor. Desde 2007 desarrolla su propio trabajo, creando las piezas Sunset on Mars (2009), Confession (2013), Isaac y Diola (2016) junto a la coreógrafa Antia Diaz.